Self-aware humor is a dangerous chasm to traverse. Its impact is completely dependent on its writer’s care and understanding of what surrounds it. Plot, characters, and atmosphere are just a few elements that need to be carefully fleshed out in order for jokes of this kind to feel clever as opposed to cringe. Films like Deadpool 2 and Scream 3 sacrifice a lot of these devices in order to shift focus onto how “meta” they can be. While clever(ish), their dependence on self-referential comedy hollows them and will eventually date them. Fortunately, Spider-Man: Into the Spider-Verse revels in the creation of emotionally resonate, flawed but endearing, and sympathetic characters, to carry itself along. Every scene is laced with unbridled excitement. 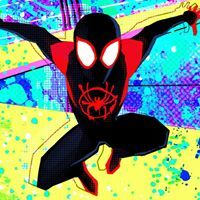 Miles Morales begins as a ‘Peter Parker type’ – unsure of what kind of person he wants to be and conflicted about how to use his newfound powers. It’s something we’ve all struggled with. Just substitute puberty for spider powers. However, at the same time, I doubt we’ve ever had other versions of us, tell us how we should act and what kind of person we have to be. Ultimatums are terrifying and Miles not only gets them from the other Spider-People, but from his family as well. It’s because of this emotional conflict that the moments of levity work. 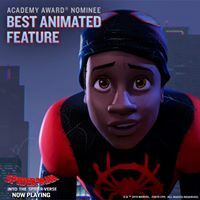 Throughout the film’s runtime, we are genuinely invested in the growth and success of Miles Morales. As if Miles wasn’t well developed enough, the writers also beautifully flesh out Gwen Stacy (Spider-Woman) and especially Peter B. Parker – a jaded, self-loathing, and endearing interpretation of the classic character. "Every scene is non-stop excitment"
Unsurprisingly, the film gives these characters plenty to do. Every scene is non-stop excitement and is sure to hold up phenomenally on repeat viewings. Action is fast, tense, and creatively shot. Banter is constantly being thrown between characters. And the film sprinkles in just enough self-aware comedy to spice things up. As an entry into a densely oversaturated genre/franchise, screwing up in this department would be easy. 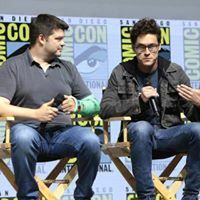 Christopher Miller and Phil Lord have already proven their comedic chops with 21 & 22 Jump Street and The Lego Movie and their unique brand of humor works just as well here. The film picks its jokes carefully and picks where to use them with even more dexterity. This and the congenial characters are only enhanced by the film’s genuinely unique visual style. Comic book panels and action splash set pieces come to life in every frame. Colors pop and explode with every web sling and interdimensional rift. It’s truly a treat. The same cannot be said for the main villain. While Doc Ock is given an exciting makeover, the Kingpin is simultaneously generic and even a bit out of place. His motivations are lazily glossed over and it’s difficult to see him as anything more than a 1-dimensional bad guy. In the face of everything that works here, this is a small nitpick. 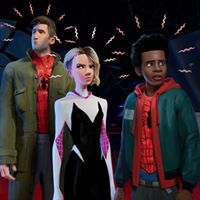 Spider-Man: Into the Spider-Verse is a heartfelt and refreshing take on the superhero genre. It’s a film that not only acknowledges its comic book roots, but revels in them. There’s so much creativity and potential in comic book adaptations – they have literally almost 100 years’ worth of material to take inspiration. If this movie is any indication of what’s to come, then it’s apparent things are only getting started.